Lets see how to make Plum Cake Recipe. Christmas is always special to me because its the month of Celebrations, vacation and moreover it is the month of shopping!!!!! . 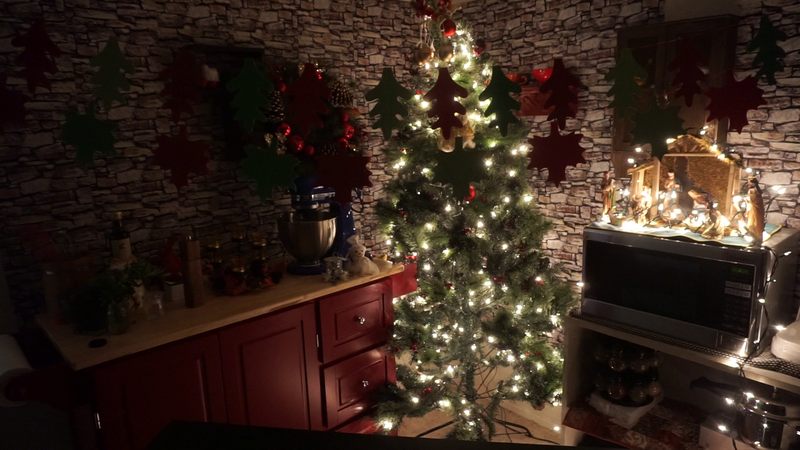 I celebrate the entire month starting from day 1 - assembling the Christmas tree till month end / year end.Too much fun throughout the month from decorating the house house till making snacks / sweets / dinner and lot more. The full month is filled with joy ,lights and is incomplete without " Cake " . I make cakes very often but the only time i make fruit cake is during Christmas. I never thought that Christmas cakes were this easy to make until i baked my first cake. Every year my dad buys 50+ cakes to distribute to his friends and family and that is the only time we buy plum cake for our home. Myself and my sister enjoy the cake and finishes it very soon even before my mom takes her first bite.But the only thing i hate about the store bought cake is they add some dates to the cake which i don't like but thank god now i can customize my cake by ignoring dates. 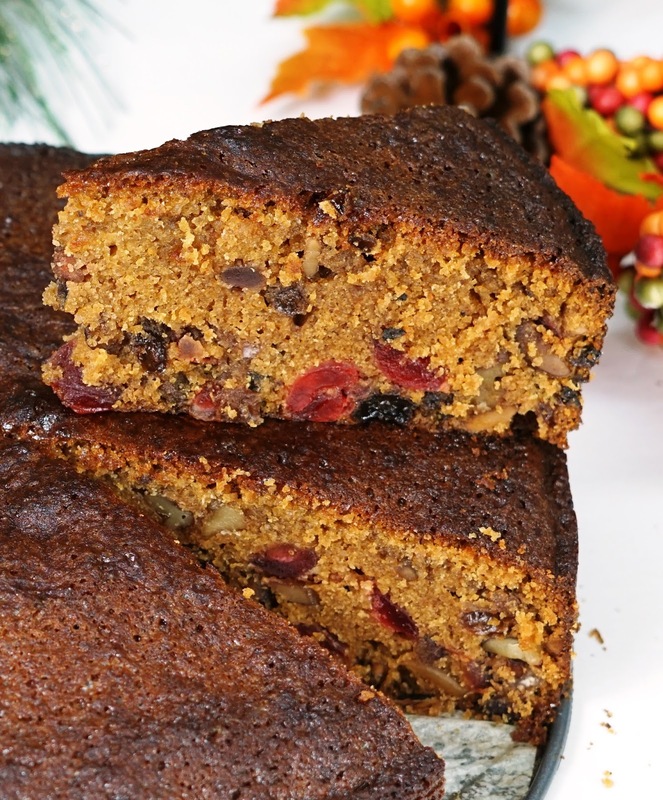 This cake is originally made by soaking the dry fruits and nuts in Rum for minimum 1 month, but i am not going to use alcohol instead i am going to use grape juice. so i am sharing this " plum cake recipe without rum " today. Soak raisins, cherry, Tutti frutti and nuts in grape juice.Add grape juice until the fruits and nuts are fully immersed. 2 cups of juice will be sufficient , if you are using rum then add 2 cups of rum. Cover and let it soak for minimum 1 day to maximum for a month.I soaked everything for 2 days. This is how it looks after 2 days, raisins are nicely soaked and most of the juice is absorbed by the dry fruits . If you want to make the cake instantly then boil the dry fruits and the nuts along with the juice for 3-4 minutes and let it cool completely and then add it to the cake batter. After two days of soaking lets start making the plum cake by caramelizing the sugar. We need to caramelize the sugar to get nice brown color or you can also add brown sugar instead. Heat 1/2 cup of sugar with 1/4 cup of water and boil it until it gets nice dark brown color( amber color) . Once you get brown color add 1/2 cup of boiling water to it and stir well, after mixing turn off the heat and keep it aside.Let it cool completely. Step 3) Spices for Plum cake ? Yes we need to add some spices for the plum cake recipe.In a blender add cinnamon stick, cloves, cardamom and also add some sugar to it and grind it to a fine powder. Refer note: 6 for the reason behind adding sugar. You can also use powdered spices if you have. In a large mixing bowl add eggs , melted butter , sugar and the powder sugar+spice and mix well. Butter should be in room temperature . If added hot then the eggs will cook so add the butter once it is completely cooled. Next add All purpose flour / Maida to the wet ingredients and also add baking powder, baking soda, salt and mix well. I added everything in the same bowl, you can mix the dry ingredients separately in a bowl and then add it to the egg batter. After mixing add the caramelized sugar and vanilla extract. make sure the sugar syrup is at room temperature, if it is hot then it will react with baking soda immediately. so make sure to cool the syrup completely before adding. Finally add the soaked friuts and nuts along with the juice. Do not drain the juice completely we need some juice in the batter to get nice taste. I added most of the juice only 1/4 cup of juice is left. The Cake batter should not be very thick it should be slightly thicker than pouring consistency . 40-50 minutes if you use 2 medium sized pan. Check the cake by inserting a tooth pick. if it comes out clean then our cake is perfectly baked. I baked the caked for exactly 75 minutes @ 350 F ie) 1 hour and 15 minutes. The longer you soak the dry fruits and nuts tastier the cake becomes. you can any fruits of your choice like prunes, dates, apricots etc..
Black Raisins add more taste to the recipe so i prefer to add more black raisins than all other ingredients .You can also mix 1/2 cup of golden raisins to it. If you want to make the cake instantly then boil the dry fruits and the nuts along with the juice for 3-4 minutes and let it cool completely and then add it to the cake batter. Do not add cold water to the caramelized sugar syrup , if we add cold water then the sugar will crystallize and will take lot of time to get into the proper consistency, so use hot water to prevent sugar crystallization. If we grind only the spices we will not end up with fine powder (because of the less quantity) so add some sugar to it and grind the spices into a very fine powder. Hi, cake looks Yummy.grape juice means fresh juice or store bought juice? Do we need to refrigerated the soaked nuts n raisins or we keep in the countertop . I used store bought grape juice, we can leave it at room temperature if you are soaking the dry fruits for 2 or less days(i left it at room temperature), i would recommend to refrigerate if you have planned to soak it for more than 2 days. Hi.. This cake looks very interesting and delicious.its also a very simple recipe without rum.planning to try it .I had a query that is can we use salted butter and omit adding salt to the batter.Have you used unsalted butter? I have tried this recipe and the taste was awesome.But the cake didn't rise up ,hence the top was bit harder and inside it was having moisture.Does this happen because of not getting correct temperature?My oven is having the temperature only in Watts.So I was unable to make the correct temperature mentioned in the recipe.Can I make this same recipe in pressure cooker or what would be the ideal Watts to set?Thanks In Advance. Yes you can use the pressure cooker method for the cake. Since you are referring to watts I assume you are using a microwave oven. This cake recipe requires heat via convection. Some microwave ovens function as a combo where you can preheat the oven to 350F and then use it in convection mode. If you are using a toaster oven then I would suggest getting a thermometer. Low temperature for long time usually yields better results. You can cover the top of the baking pan with a aluminium foil and this will prevent the cake from drying on the top. All the best !! Hi Angela, We have tried the pressure cooker method, we kept the cake for 30 - 40 mins in pressure cooker. The cake has come out awesome and tasted great it and was soft as well. Yes, as you said the problem is with the temperature setting in the Oven. With pressure cooker it came out the rite way. Thank you so much for the recipe. Wish you a Merry Xmas and a Happy New Year. I am glad that the recipe turned out well. Wish you and your family a Happy Christmas and a prosperous New Year !! Hi Angela..I tried your recipe using salted butter and it's awesome..Tastes much better than the bakery ones..My kids just can't stop eating it.. Thanks a ton for sharing such a wonderful recipe..Merry Christmas! Thank you Vinsi for your wonderful feedback. I am happy that your kids liked the recipe. Do try more recipes from our blog. Wish you a Happy Christmas and a prosperous New Year ! Bake it over a medium heat, Do not place the cooker weight. it will take a little longer time than usual ( 1 hour -1 .30 hours). check after 1 hour , tooth pick inserted at the center should come out clean if not bake it for some more time. If you need any details please leave a comment. All the best, I will be waiting for your feedback. Happy Cooking !!! I'm trying to make a nut'n raised cake. It's requires welchs grape juice and just raisen and pecans. Have you heard of such cake? If so, how do you make it. It looks so similiar to this cake. I tried the plum cake recipe it cane out really good. Thanks for helping me out on my first cake try out :). Thank You for the recipie!! Can you please tell me how to prepare grape juice at home? வணக்கம், இன்று இந்த ப்ளம் கேக்கை நாங்கள் முயற்சி செய்து வெற்றி கண்டோம். நன்றி சகோதரி. Hi steffi, I love to watch and try your recipes.. can u tell me measuring 1 cup.in grams please..
Hi Steffi I would like to try your receipe. Can I use Brown sugar?If yes then how much? Hi, Can we use red wine instead of grape juice? Will it affect the flavour? Hi Steffi, were did u get the Tutty frutty, I am in Bangalore our store here have a different. hii...can u please tell the measurement for 1 cup flour in grams..?